It’s a sure sign of spring now that the killdeer have returned. They are a large, double-banded plover that screams its name across farm fields and other grass and dirt covered habitats. If you see an orange-tailed, stripe-winged bird calling kill-deee, kill-deee, you can be assured that it’s this plover. Many killdeer were shot during the late 1800’s, along with a wide range of other shorebirds. These species are now protected from harm by federal and state laws. On its white breast, two black bands stand out. Killdeer are wet-sand brown above and clear white below, with white around the front of the face and eye. A farmer’s friend, the killdeer spends its foraging time searching for beetles, grasshoppers, caterpillars and other insects. Crayfish centipedes, spiders and other invertebrates are also eaten as well as some seeds. 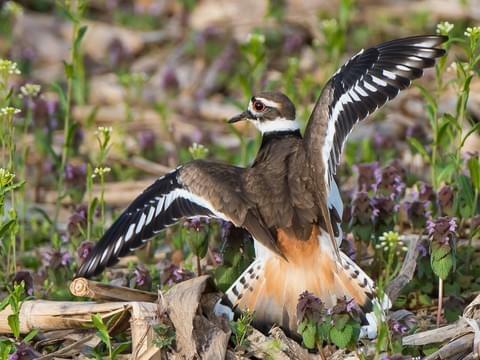 There will be more on the killdeer, since they are so interesting Efrain and Barbara Rivera, your hosts at Songbird Prairie, want to keep you informed of the beauty of nature here at the Prairie in Valparaiso, Indiana. We have blogged this near the Dunes National Park. Come and leave your footprints in the sand.